Users will be able to choose between six different straps, including a sport band, a leather loop, a classic leather buckle and a stainless steel strap that is easily adjustable. The watch will come in two different sizes and three different collections: Watch, Watch Sport and Watch Edition. Unsurprisingly, the Apple Watch will only work in conjunction with an iPhone, but you will need a relatively recent model, starting with the iPhone 5. Cook stressed that Apple didn’t just take the iPhone and put it on your wrist. Pinch to zoom, for example, wouldn’t work on a watch. Instead, the watch has a small dial on the side — Apple calls it a digital crown with IR and LED diodes. Pressing the dial will take you to the watch’s homescreen, which users can personalize just like the watch face. The interface makes full use of the digital crown, and developers will be able to use it for their own apps. The Apple Watch will also be using voice input through Siri. The dial also understands the difference between a simple touch and a press, and the watch will offer at least some haptic feedback. As expected, the watch interface will heavily center around notifications and like Android Wear, it will feature the ability to send quick replies, but in a typical Apple twist, the company will look at the text and analyze that to automatically select a few possible replies. 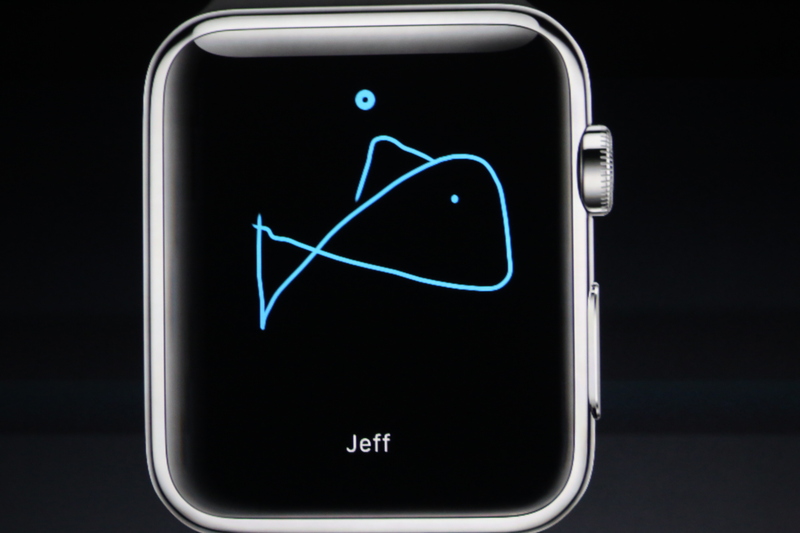 The watch also features customizable animated emoji. By default, all standard iPhone notifications will appear on the watch homescreen, but developers will be able to create custom notifications for the Apple Watch. In addition, developers will also be able to create apps specifically for the watch and some of the brands Apple featured today include Apple, American Airlines, BMW, Nike and Starwood Hotels. Apple also built a cool way to see your photos. You start out zoomed out, with all of your photos showing as minuscule thumbnails. Then you use the crown to zoom in. The watch uses the same gesture to zoom in and out of Apple Maps, too. Ahead of the event today, the Apple rumor mill went through its usual cycle of going from rather outlandish ideas like a solar-powered watch (an idea Apple supposedly canned pretty early on), to more realistic ideas like curved screens, scratch-resistant sapphire crystal glass and the possibility that Apple could release the watch in at least two different sizes. The early word was also that the battery life was going to be less than optimal. Over the last few days before the event, we also started hearing more about Apple integrating the watch with its rumored new NFC-based payments system. Overall, the rumors weren’t all that far off. The event is ongoing. We will update this post as we learn more.